Not much movement in the rate markets last week. 30 year fixed par rates still holding steady at 4.75% – usually having to pay a portion of point to get that rate. 15 year fixed have settled in at 4.25% and 5/1 ARMs at 3.25%. Those looking for a more stable loan below 4% are increasingly looking at 7/1 ARMs and 10 year fixed loans. 7/1 ARM par rates start at 3.625% and 10 year fixed loans start at 3.75%. I would recommend locking these type of loans so you don’t get hit by these pricing changes. I touched on this two weeks ago and it bears repeating. Many customers will see a large increase in pricing in the very near future. Loan level price adjustments with Fannie Mae and Freddie Mac will be going into effect for loans sold to these agencies as of April 1st, 2011. Lenders will make price adjusments in advance of this to assure they can get their loans to these agencies in enough time without taking a hit to their profitability. These changes will go into effect with most lenders by the end of January 2011. Higher Loan to value loans – you will get a pricing hit regardless of credit. So the vast majority of customers will see increased pricing on their mortgage quotes in the very near future. Loan to values of 70% and higher are going to see large hits and customers with less than perfect credit scores will see very large hits. If you are waiting to lock a purchase loan or to refinance , you may not want to wait much longer if you fit into the loan descriptions above. Please email me if you would like to see the Fannie Mae announcement so you can review the pricing adjustments. The big news this week in regards to mortgage rates was the unemployment reports. Unemployment dropped .4%, from 9.8% to 9.4%. Though the number sounds good, it didn’t boost the stock market due to the amount of people getting out of the job market. An unemployed person is defined by someone looking for work that is not working. If you are not looking , you are not considered unemployed. This report gained some momentum in the bond market as the economy is still recovering at a very slow pace. The market took money out of stocks and into bonds – lowering rates last week. As of Monday morning – 30 year fixed par rates dropped to 4.625% , 15 Year Fixed to 4.125% and 5/1 ARM loans to 3.25%. Overall a good improvement in rate/pricing. This is the best I have seen rates in 2-3 weeks. Here is a link on what one expert thinks will happen with the mortgage market in 2011. http://www.msnbc.msn.com/id/40913669/ns/business-real_estate/ . I agree with all points except the last one – loans can still be done in a timely manner. Rates start off the new year solid. 30 Year Fixed par rates are still at 4.75% , but with a decent yield spread premium so most will require a low amount of origination fees for this rate. 15 Year Fixed rates down to 4.125% and 5/1 ARMs have hit 3.25% again. Keep in mind every loan prices different based on a borrowers specific situation. Big News in loan pricing. Fannie Mae is chaning the pricing on loans over 70% loan to value. This means if you fall into a loan to value range of 70-80%, your loan will begin to price worse soon. If this is the case, you may want to try and get something started before the pricing changes go into effect. November’s housing data reports show existing single family residence sales up 5.5%. This is much better than the 10% decrease we saw in October’s reports. I still remain skeptical that we are on the route to recovery. Until this foreclosure / short sale situation is more resolved, I don’t see significant improvement in the housing market – specifically in regards to home values. Last week was a wild week. 30 year fixed interest rates went from 4.75% to 5.25% in two days of massive mortgage bond selloffs. Then on Thursday and Friday the bond market rebounded in a big way, bring rates back to where they started on Monday. 30 Year Fixed Conforming Par rates currently sit at 4.75% , 15 Year Fixed at 4.25% , 5/1 ARMs at 3.375%. I often get asked if rates will go back down. Every analyst / expert I read basically says the same things. 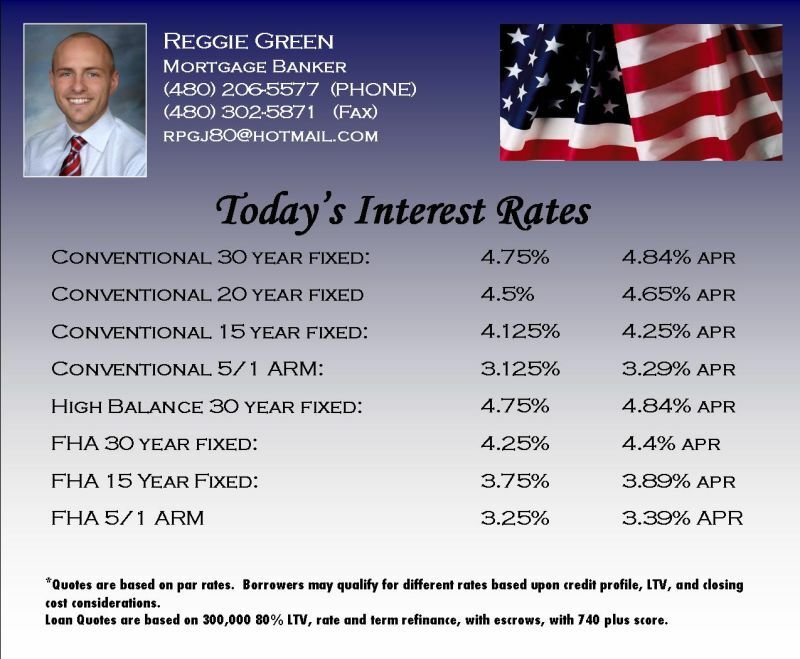 Rates could go a little lower, but we will not see rates back down to 4% again. The low was hit and is gone. One thing to keep in mind is this quarter saw a lot of economic reports that exceeded what Wall Street expected. When the stock market is going up / rates are usually also going up. Investors are taking their money out of safe treasury bonds and putting them into the riskier stock market. If the recovery in the stock market and economy continues – rates will continue to go up. Remember – we are doing a lot of appraisal free loans for FANNIE MAE customers – check here to see if you are in a FANNIE MAE loan: http://www.fanniemae.com/loanlookup/. We can also loan at up to 105% Loan to value on customers with existing FANNIE MAE or FREDDIE MAC loans. Check here to see if you are in a FREDDIE MAC loan: https://ww3.freddiemac.com/corporate/. If you want to know how your loan prices, just send me the information below and I can put together a quote for you. Please call me if you have any questions and have a great week!! Another week , another rise in interest rates. This time rates haven’t risen, but pricing has. Last week you could get a 4.75% 30 year fixed with 0 or close to 0 points – that same loan now will cost about a point. Rates have now risen for 5 straight weeks – going up about .75% higher overall on fixed loans. Many customers are turning to Adjustable Rate Mortgages instead to take advantage of the lower rates. These rates are still in the low to mid 3%’s – the most popular loans being 5/1 and 7/1 ARMS. These loans are fixed for 5 or 7 years and then adjust once year after the fixed portion. These are good for borrowers not planning on being in their home longer than the fixed period , or borrowers that have decent equity and could refinance 5 to 7 years down the road even if the housing market doesn’t go back up. Please call me if you have any questions regarding your eligibility for new loan programs. Have a great week!